Remote equipment location application integrated into CDK dealer management system’s electronic service scheduling system gets dealer’s field service teams to customer repair sites faster and equipment operators back in service sooner. RDO Equipment Co., headquartered in Fargo, ND, operates more than 75 equipment dealerships in 10 states, and through partnerships at 29 locations internationally. Its main lines are John Deere agriculture and construction equipment, Vermeer forestry and horizontal drilling machinery, and Topcon positioning systems. RDO Equipment Co. has been a CDK Global Heavy Equipment customer since 2003, when its management recognized that its then-current dealer management system (DMS) provider could not provide for the company’s growing technology needs for its expanding network of dealerships. .
Five years ago, they integrated PreCise® mobile asset tracking device data from its field service trucks into its IntelliDealerTM electronic service scheduling work order tool. The information comes from John Deere’s locator technology, JDLinkTM*, via standard AEMP protocol data transfer. "The index on mobile field response time increased over the past 12 months from 56.87 to 61.82 percent.” - Wayne Danielson. Wayne Danielson, manager of Aftermarket Systems for RDO Equipment Co., credits this PreCise-IntelliDealer integration for providing the company’s dealerships with faster in-field service response times, as indicated by customer survey responses. The survey measures the company’s Net Promoter Index (NPI), a measurement of how well a company’s actions foster customer loyalty. When RDO Equipment Co. field service dispatch receives a call that a customer’s machine has broken down or otherwise requires service in the field, the dealership’s field service advisor opens a service work order in IntelliDealer. A click on the PreCise button on the work order header opens a digital map showing that machine’s field location. RDO Equipment Co. field service trucks have PreCise model IX-403-H GPS receivers and 3G cellular radios so they can be dispatched based on latitude and longitude to the customer’s machine location. Danielson explained that John Deere heavy equipment is factory-installed with JDLinkTM*, a web-based locator. 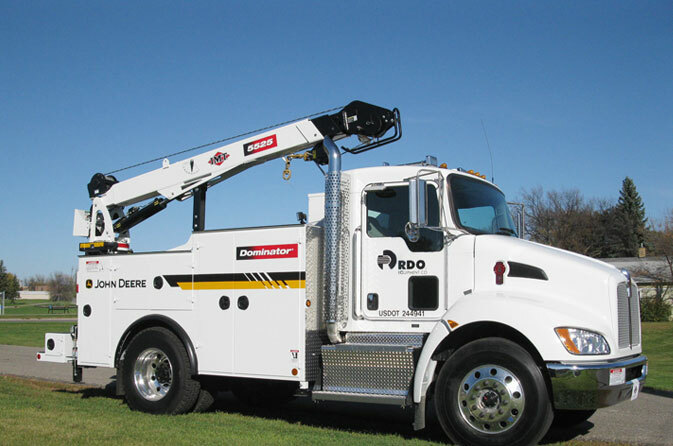 PreCise, installed in the company’s field service and non-service fleet, enables RDO Equipment Co. to not only identify where a machine is for a service call that has been received but then vector the nearest, best qualified technician to perform the work on that type of machine most quickly. Danielson worked with PreCise and CDK to customize IntelliDealer so work orders open with a direct link through PreCise to JDLinkTM* to start the field service dispatch process. In the field, technicians receive dispatch data and customer machine location on smartphones or laptops. Through their mobile devices, technicians can access parts look-ups through IntelliDealer, write repair descriptions into work orders, execute the work order and schedule billing based on customers’ preferred methods of payment. Field communications conducted through live-time transactions are secure behind RDO Equipment Co.’s VPN.